Capella’s contemporary condos provide modern living with homes featuring refined finishes, private balconies and beautiful views. Your home should enhance your everyday. 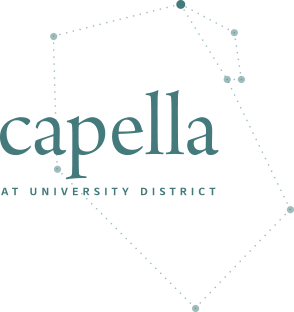 Capella can be a true reflection of your style. With three design palettes curated by our Brookfield Interior Designers and offering a wide spectrum of style choices, you can create an expression of your lifestyle. Elegant and dramatic with a carefully balanced combination of eclectic and contemporary touches, this design style creates an overall feeling of depth and gravity. Carefree and relaxed while maintaining a subtle essence of sophisticated worldliness, this interior is an expression of individuality. Industrial elements like wrought iron and metal are counterbalanced by fresh white accents in this pleasingly warm and comfortable design style. With underground parking, a fitness studio and a beautiful two storey lobby, Capella is connected living designed to enrich your life.